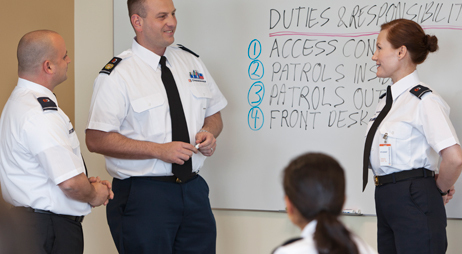 What are the educational requirements for a person who chooses to become a security guard? This is often a question for many. Most often, the only requirement is a high school diploma. But those deciding to go higher up in their career, can continue education in criminal justice or law enforcement. However, local colleges offer courses in varied fields related to security – homeland security and public security that helps you furnish your resume with additional enforcements. Many of these colleges offer courses online. At the end of the program, a certificate of completion is provided. Online programs are geared towards providing students a basic knowledge in security – private and corporate. Loss prevention and crime prevention is covered in these programs. These online courses can be completed through distance learning. Those already working with an establishment should enquire with the employer to find out if they can obtain recommendations. Some job profiles may require the security guard to carry arms, in which case training is required. Using batons, guns are usually taught in training course. As these are related to the job profile, one may well invest in them to make their resume stand out among others. It will help impress future employers. Those wishing to work with banks and financial establishments will require training in firearms. Investing in a training course that provides firearms training will bring additional returns. Crime prevention requires being vigilant and alert. Other than that, somebody in sound health and mind can apply for this role. There could be questions surrounding the exact requirement but there is nothing to worry about. A high school diploma should be sufficient. Well, in general, the more you know about the field the better your chances of securing a job. So, look for a course that enhances your knowledge. If in doubt, consult an experienced security guard about the requirements so you can decide what is best for you. Women and men both can enrol in them. While it is not absolutely necessary to possess a degree to become a security guard, there are benefits if you have completed a high school diploma and a course. Increased wage and better job opportunities should drive the decision. Those studying online security guard training courses should be mentally prepared to work in various settings – both public and private. Some may be required to work with computers and hence should be proficient with the machine. Departmental stores, hospitals, office buildings, banks, retail stores, government buildings and storage facilities employ security guards. Law enforcement facilities, courts, correction facilities also require security guards. Life has its challenges. Choosing a career for those who do not wish to pursue higher education may be difficult. The options though there may not offer as much wage as they would need to live an inspirational life. But that is a trade-off they will have to settle for. Yet, there are challenges in the life of a security guard making it worthwhile to pursue a program.